The martial arts genre is an area of cinema that I have largely ignored, and for the most part remain unfamiliar with. Much like India's Bollywood, China and Japan have produced so many martial arts films over the years that it has become its own industry, and most never make it to American shores. There was an upswing in wuxia films after the success of Crouching Tiger, Hidden Dragon, but those dwell more in the land of art and fantasy. This is something different, a much less highbrow style of filmmaking that is more akin to the grindhouse films so beloved by Quentin Tarantino and Robert Rodriguez, the kind of film that Bruce Lee and Sonny Chiba made a career out of starring in. 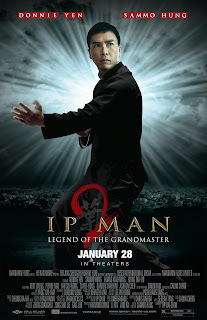 Out of that tradition comes Ip Man 2: Legend of the Grandmaster, the sequel to the international hit, Ip Man. But unlike the grittier martial arts films that serve as its inspiration, Ip Man 2 is a much grander and more refined experience, a natural evolution and maturation of a venerable and successful genre. Based on the life of Ip Man (Donnie Yen), the legendary martial arts grandmaster who trained Bruce Lee, Ip Man 2 finds Ip and his family moving to British occupied Hong Kong, where he attempts to set up his own martial arts school to teach his unique style of Wing Chun. He is met with resistance, however, by a group of corrupt martial arts masters, led by Hung Chun-nam (Sammo Hung), who refuse to allow Ip to become a true master until he passes their test and pays his dues. But as Ip's students square off against the students of other disciplines, a greater threat arrives in Hong Kong - a western boxer named Taylor "Twister" Milos (Darren Shahlavi) bent on asserting his superiority over Chinese martial arts, by humiliating its practitioners in the ring. Suddenly, the more peaceful minded Ip and the hot-headed Hung have a common enemy around which to unite, as the dignity of a nation rides on one boxing match that will have a profound impact on Hong Kong and all of its citizens living under colonial rule. Ip Man 2 feels a bit like a Chinese Rocky IV, but the fact that it is a true story makes it all the more inspiring. While the film tends to paint in broad strokes, especially in its characterizations of the villainous British, the film's expert pacing and heartpounding action sequences more than make up for it. One always expects films of this nature to be a bit broad, it goes with the territory, but it is often so wildly over-the-top as to be distracting. 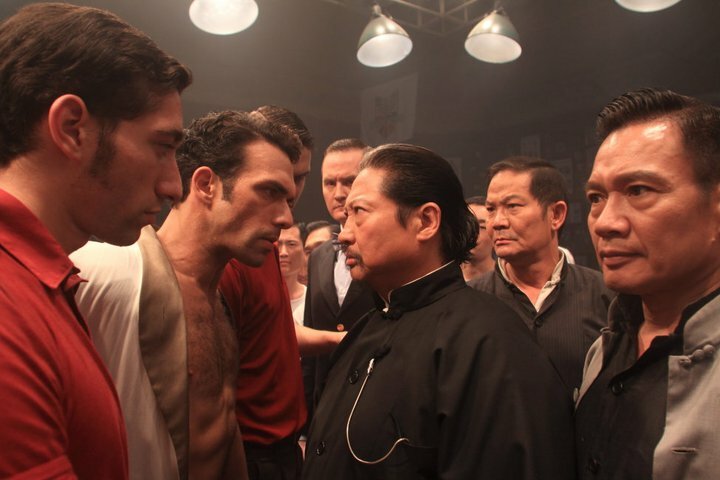 Still, director Wilson Yip knows how to deliver the thrills, and Ip Man 2 is a nonstop machine of breathtaking action. The fight choreography by the legendary Sammo Hung is nothing short of stunning. As the main reason people go to see films like this, there is a lot riding on the martial arts action, and the film delivers in spades. But no great martial arts film would be complete without a great hero, and Donnie Yen is magnetic as the gentle but powerful Ip Man. His kind and unassuming countenance and humble demeanor mask a master fighter, and when he unleashes his controlled fury on an opponent, the result is truly incredible to watch. 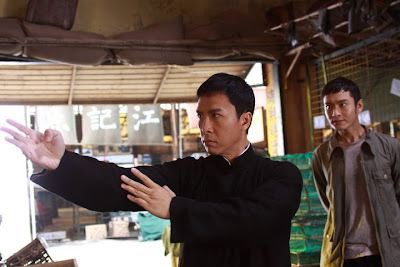 For fans of martial arts, Ip Man 2 is a must, but even for non-fans like me, the story is irresistable. It's a pretty standard David vs. Goliath tale, but Yip keeps the pacing so crisp and the characters so engaging that it's hard not to get swept up in the action. It is, above all, pure fun, an adrenaline pumping action film that is both well crafted and tightly controlled. This is action as it should be done - a grand piece of fluff entertainment that doesn't insult the audience while still making them want to stand up and cheer. And that is a rare feat indeed. IP MAN 2: LEGEND OF THE GRANDMASTER | Directed by Wilson Yip | Stars Donnie Yen, Sammo Hung, Lynn Hung, Simon Yam, Xiaoming Huang, Siu-Wong Fan, Kent Chen, Darren Shahlavi | Rated R for violence | In Cantonese with English subtitles | Opens today, January 28, in select cities.